I love to cook! I love to eat! That is why I like the holidays, and of course enjoying time together with family and friends. 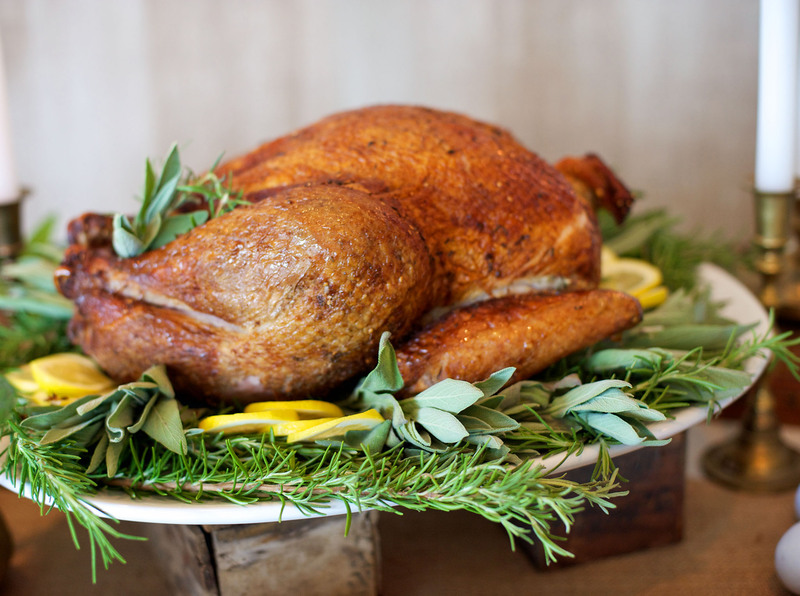 I grew up in a home where life evolved around the kitchen table and good food. My mother’s family were all good cooks. My father’s family were all good cooks. My siblings are all good cooks, in fact I don’t think there’s a bad cook in the whole wild bunch of us. Emotions, happy or sad, are expressed with food at our house. Not just basic food, but mouth-watering delicious from scratch food. Where the main ingredients had to be fresh, preferably home-grown or from a nearby farm or dairy (always including staple ingredients of cream, butter and whole milk). If it was winter we went to the pantry for home canned fruits and vegetables and out to the freezer for meat. (usually deer or elk from my fathers hunting expeditions) A pre-packaged meal or a cake mix in my mother’s kitchen was unheard of. As a child, in my eyes, my mother WAS Betty Crocker! 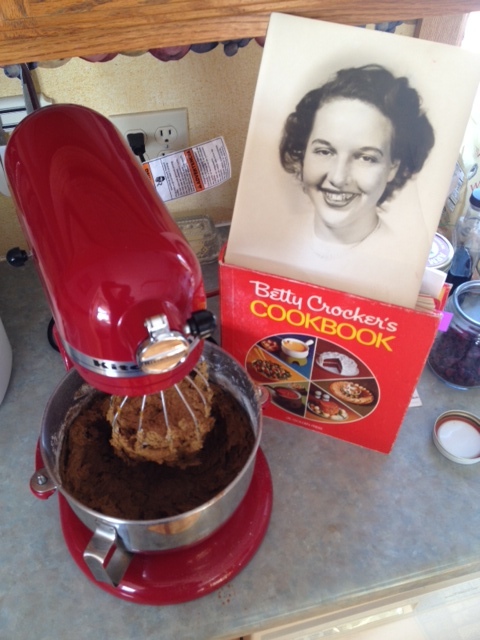 Three things I am thankful for, Mom, Betty Crocker and Kitchen Aide mixers. In addition to salt and pepper she taught us the proper use of herbs and spices to enhance the flavor of food. Mom didn’t measure very often, she was a “little pinch of this and a little pinch of that” kinda cook. “Just shake it in until it looks right” she’d say. With my collection of herbs and spices that litter my kitchen cabinets, I perhaps have taken their use a little too far. After many years of my kids teasing me about the strange green stuff in little plastic bags tucked in my pantry I decided to do something about the mess. 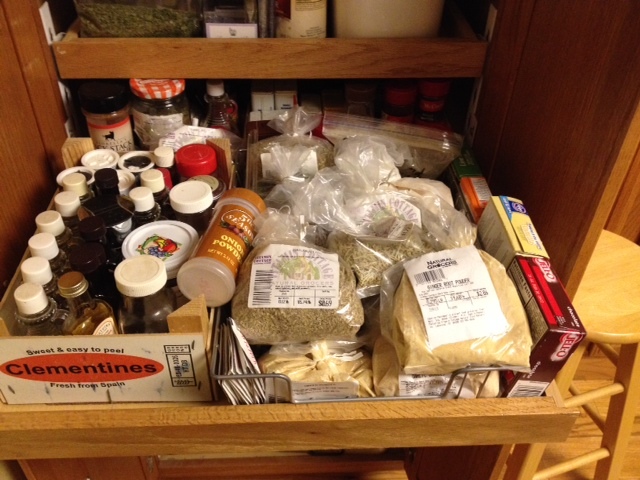 Before the chaos of holiday cooking hits our little kitchen I set out to get things organized. 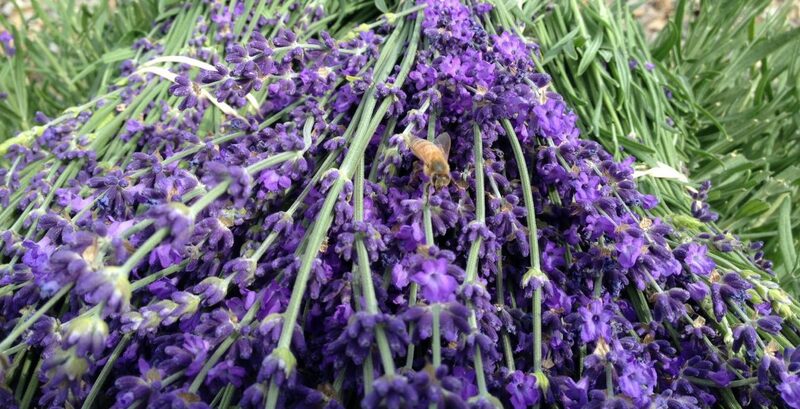 I like to buy herbs and spices in bulk at natural food stores, like Natural Grocers or Sprouts, because they are fresher and more economical than what is available at most retail grocers. Unfortunately all the little plastic bags make a mess of my shelf. 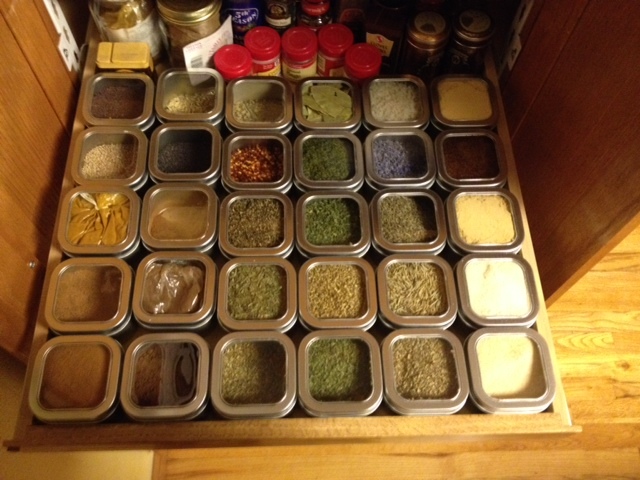 On my quest for organization I found these great spice tins online at Specialty Bottle Supply. For just .93 cents each these square spice tins with a clear tight-fitting lid hold 8 oz of dry ingredients. So I sat out to sequester the spices! 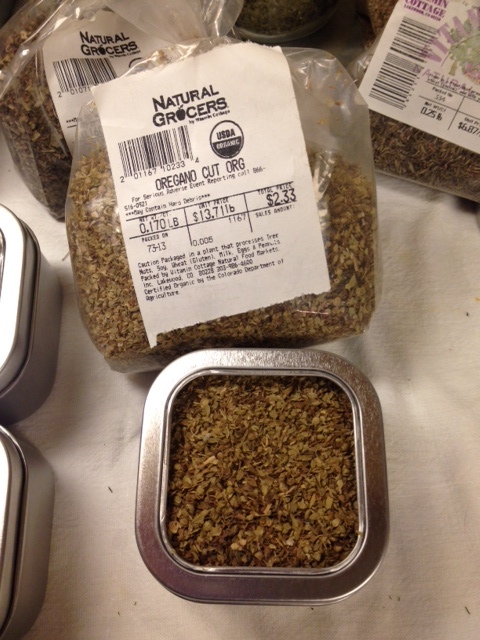 $2.33 is a nice price for dried organic oregano. This bag filled 2 tins, so even adding in the price of the square tins, it’s very economical. 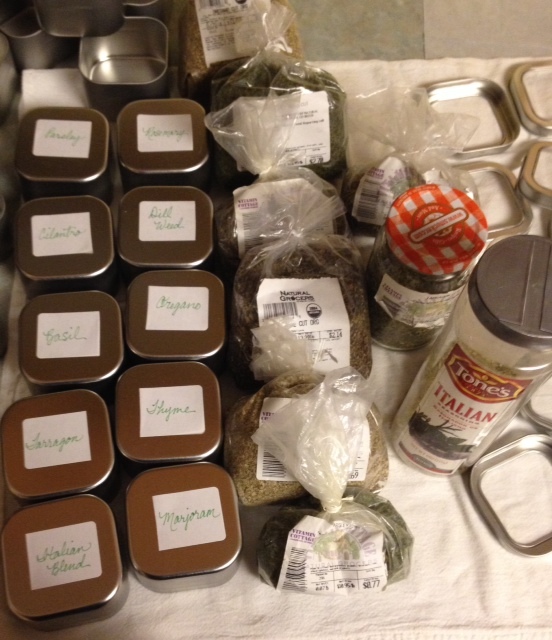 One by one I washed then labeled and filled each little tin…….I kept finding more and more herbs and spices jammed at the back of the cabinet, so I kept washing, labeling and filling. If your herbs and spices look anything like my mess, give this a try, the results are wonderful. Now I’m ready, bring on the holiday cooking, baking and all the fun kitchen chaos that ensues.